The much-awaited moment arrived when we welcomed the teams from Spain, Italy, Turkey, Romania and Poland in our school. At 9 o’clock the official opening ceremony started with our Comenius anthem, then the Headmaster, Tamás Beleznay welcomed all the delegations. He called everybody’s attention to one of the objectives of the meeting: to experience the ’dance-house’ , the unique Hungarian method of keeping traditions alive which is on the UNESCO World List of Intangible Cultural Heritage. The head of the school district, Dr. Marianna Tolnai also greeted the teams. High schoolers sang folk songs and primary students performed folk dances in traditional costumes. The Hungarian students introduced the school in groups to our visitors by giving a tour of the building. A student presentation provided insight into the Hungarian school system and also gave information on Hungary. Then the students participated in a 45-minute lesson they chose: art, or technology or a PE lesson with Hungarian students. An important music lesson followed to practice ‘Tavaszi szél…’, the famous Hungarian folk song about spring and love. Our heart filled with joy as we heard how well all the teams learned all the verses by heart! Different adaptations of the song in English were also shown. An exhibition showing photos sent by the delegations was carefully looked at and each delegation gave six votes for their favourite pictures. 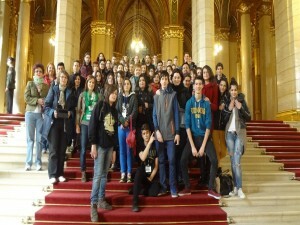 The photos were chosen to express what the Comenius project meant to the participants and also to show the highlights of the meetings. After having lunch at school, students and teachers went on an adventure tour in groups to discover Budapest by finding certain places described on a task sheet. Some were famous sights, other places had not very well-known treasures that curious Hungarian and visitors had to discover together. Back at school at 5 o’clock, we had a folk band: ‘Így tedd rá!’ (≈ This is the way to put your feet!) to introduce us to the concept of dance-house. Professional dancers taught us the steps of Hungarian folk dances then we all danced together for live music. We all sang ‘Tavaszi szél together in Hungarian accompanied by the band. Some girls and boys even had the chance to put on traditional costumes. The students spent the evening with their hosts while the teachers and school officials met in a restaurant to try some of the specialities of the Hungarian cuisine and to have a relaxed conversation. The day started with a visit to the Museum of Ethnography. While the students were looking at the exhibition with the help of an English-speaking tour guide, the teachers had a meeting. Then the teachers went around the museum, and the students enjoyed a crafts workshop where they made a leather purse to take home. After lunch at school we went to the Buda Castle District where we first watched a 3D film on the building of the Castle. Later we walked around the district with the help of Andrea who is a tourist guide as well, looking at the most famous sights: the Matthias Church and the Fisherman’s Bastion. We ventured into the Labyrinth then walked down to the Danube to have a cruise along the river and we could enjoy the view of the city illuminated in the evening. The students spent the evening with their hosts but the teachers – after a quick dinner at school – had a meeting discussing the upcoming activities and meeting which are to be the last ones of this project. The day started with a visit to the Parliament. After the security procedure to get into the building, visitors and Hungarians alike were enchanted by the beautiful interior and the excellent guide whose talk was informative and could be easily understood. Then we walked to the St. Stephen’s Basilica and also admired the view from the tower. The windy weather made us change plans and the teams had lunch in the city centre instead of the City Park. In the afternoon we took the first underground in the continent to visit Heroes’ Square with the statues of historical figures. We also went to the Zoo. Coming back to the centre we walked through a small part of the City Park. We had a traditional Hungarian dinner together in a restaurant. Then we went to the Fonó, the most well-known dance-house in Budapest where every Wednesday there are beginner and advanced level courses of traditional dances followed by free dance to live music. A professional dancer taught us some dances and in no time the atmosphere was fantastic. Our visitors were able to see how the dance-house movement contributed to keeping traditions alive. We had a reception at the District Town Hall by the deputy mayor of the district, Gyula Formanek - who used to be a teacher at our school and now is responsible for the educational matters. The local TV conducted an interview about the Comenius project. Later we walked up to Gellért Hill to enjoy the spectacular view of Budapest – though some teams opted for more free time. In the afternoon everybody had some free time. By the time we gathered at school for an evening of pop rock music and for the celebration of the photo exhibition, the host families prepared a feast of homemade food for all the participants: teachers, students, parents, siblings and friends. We were happy to see how much their effort was appreciated by our visitors. The ‘COMENIUS’ GOT TALENT’ karaoke competition showcased excellent performances by the teams who sang in their own language and danced for a hit song from the 90’s or 2000’s. Our students really got talent! The jury was made up of representatives from each country and one person gave some comments after each presentation. There were also some dances by Hungarian students. After the performances it was time to enjoy the good food. Then the results of the karaoke competition and the photo competition were announced. The party continued with a karaoke where a teacher – also a DJ – contributed to the real party atmosphere where students and teachers sang together. The party was a farewell party as well. Saying goodbye was not easy – we could see that the participants of this meeting (which was already the sixth gathering in the two years of the project) have become more than acquaintances for each other, they have become friends. On Friday it was evaluation time and departure day for the delegations – the last goodbyes.